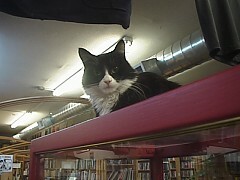 Spatz lives at a bookstore called Twice Sold Tales in the Capital Hill neighborhood of Seattle. 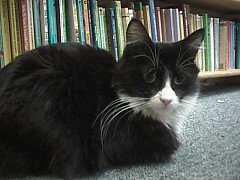 He lives with his friends Nesbit, Sissy, Buster, Nevada, and Honey. 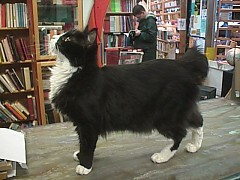 Note: Spatz became very ill in Feb. 1998, and had to be put to sleep. I'm not sure how old he was, but he was still pretty young. We'll miss you guy!